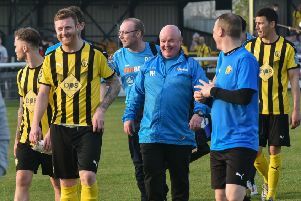 Leamington have picked up some memorable results in their two spells in the National League North and this one was right up there with them as they edged out in-form Chester on their first visit to south Warwickshire, writes Paul Edwards. Under the stewardship of former Salford City joint-managers Anthony Johnson and Bernard Morley Chester have quietly gone about their business after a sticky start to the campaign and they arrived at the Phillips 66 Community Stadium just a point off the top of the table. However, mindful of the shock result when Brakes visited his former club last season, Johnson had warned his players in the local press that they would be in for a tough game and that was exactly what they got,as Paul Holleran’s side battled for every ball, took the game to their illustrious opponents and edged ahead inside the final ten minutes thanks to Colby Bishop’s third goal in four games. Both sides began an entertaining contest brightly, Chester being first to show with Daniel Mooney’s shot being blocked behind for a corner. Callum Gittings tested visiting keeper Grant Shenton for the first time when he was played into the box by Kieran Dunbar. The ball was then played back in, with Bishop scooping a difficult chance over the bar from close range. Leamington could sense they had rattled their visitors, for whom Gary Stopforth was forced to hack the ball clear following a scramble in the box as Jack Edwards closed in. Tony Breeden produces a fine reaction save. Gittings found himself in the referee’s notebook and from the resulting free-kick Jonathan Moran glanced a header into the arms of Tony Breeden. At the other end, Dunbar linked up superbly with Junior English before skipping past a challenge and driving a shot towards the near post which Shenton saved, with Bishop waiting for a pass in the centre. The goalkeeper came to Chester’s rescue again shortly afterwards when he bravely blocked a towering header from Jamie Hood as he met Dunbar’s right-wing corner at the far post. Connor Taylor was next to try his luck, the bouncing ball falling nicely for him on the edge of the box to swivel and crash in a powerful low volley which was held at the second attempt by Shenton. Despite Brakes’ chances it was Chester who came closest to breaking the deadlock before half-time, Simon Grand’s header from Mooney’s free-kick cannoning back off the crossbar. The same player latched on to the loose ball to fire in a powerful effort that produced a fine save from Breeden. Taylor was on target again with another well-struck volley but Shenton was equal to it once more, pushing the ball to safety with another good save. Breeden was forced to beat away a fine strike by Adam Dawson but was fortunate from the resulting corner as he was caught off his line and Steve Howson hooked his shot over the bar. Connor Gudger was then well placed to hook Grand’s header away from the line as Chester continued to create chances. Dunbar was left frustrated when a goal-kick was awarded despite his shot taking a clear deflection. The game continued to ebb and flow and Taylor’s cross was driven back across goal by Bishop with no team-mate in a position to finish it off and Chester then broke quickly, James Mace having to make a superb challenge inside the penalty area. The ball was eventually played in and Breeden was forced into another fine save, this time from Craig Mahon. Bishop fires home the winner. The scales tipped in Leamington’s favour with seven minutes remaining. They moved swiftly upfield, with Taylor driving into the box on the left and forcing another save from Shenton, who was unable to hold onto the ball, allowing the predatory Bishop to slam it into the net from close range. There was still ample time for more twists and turns and Chester came close to an injury-time leveller when Mooney’s low strike from distance looked destined for the bottom corner, only for Breeden to pull off one of his trademark instinctive last-ditch saves to win the game for his side, with the follow-up fired high over the bar. Holleran felt the enforced break had been of benefit to his side as they sprung out of the traps early on, saying: “I think it showed in the opening stages. “We were full of energy, building on the back of the Nuneaton performance and victory. “We always knew this would be a really big challenge. “You know what you’re going to get with Bernard and Anthony’s teams - they’re hard working, honest, with a sprinkling of quality. “It was a really good test for us and it was pleasing for me as the manager to see our players go toe to toe with a good side and come out on top. Brakes: Tony Breeden, Junior English, Connor Gudger, Reece Flanagan (Joe Clarke, 90), Jamie Hood, James Mace, Kieran Dunbar, Callum Gittings, Colby Bishop (Ahmed Obeng, 90), Jack Edwards, Connor Taylor. Subs not used: Jack Lane, James Bowen, Tom James. Chester: Grant Shelton, Jonathan Moran, Simon Grand, Gary Roberts, Danny Livesey, Steve Howson, Daniel Mooney, Gary Stopforth, Anthony Dudley (Manny Dieseruvwe, 84), Adam Dawson (Dean Smalley, 84), Craig Mason. Subs not used: Dominic Smalley, Cain Noble, John Pritchard.